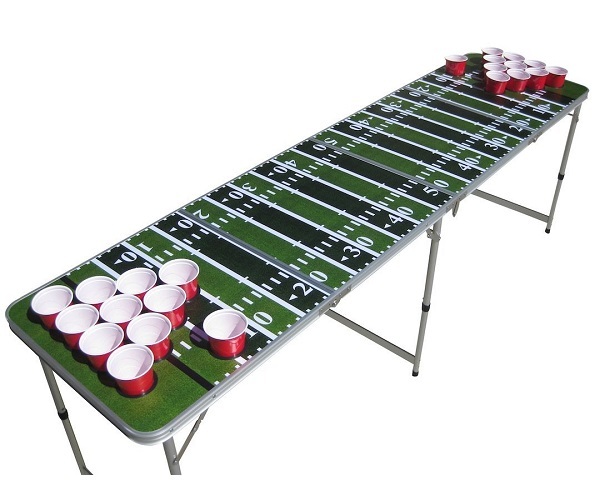 This Football Beer Pong Table features a full-sized regulation table for playing beer pong. The compact beer pong table measures 8 feet by 2 feet by 2.5 feet and folds up to a 2 foot by 2 foot square. At 20 pounds, the table is study enough for both backyard parties, and parking lot tailgating on game day. There are 22 holes, including 10 on each side for game cups and one extra hole on each side for wash cups. The deep pockets and plastic rims surrounding each hole provide protection, so that inebriated friends don't make a party foul and spill valuable beer all over your table. The beer pong setup is a big advantage on a windy day, with cups blowing over. The pre-drilled holes in the beer pong table also provide ease when re-racking. Customize your football beer pong table with stickers from your favorite NFL team or college team, or add your own homemade logo.